Cargo bikes in the US are growing up. In Seattle, one cargo bike has been leading the pack ever since its first appearance: the Wonderful, World-Changing EdgeRunner. Smaller rear wheel leads to a lower center-of-gravity for your passengers or cargo, which makes the bike more stable under load, excellent catalog of kid and cargo-hauling accessories, great quality of construction and parts used, blah blah blah. You've heard us say all that before. 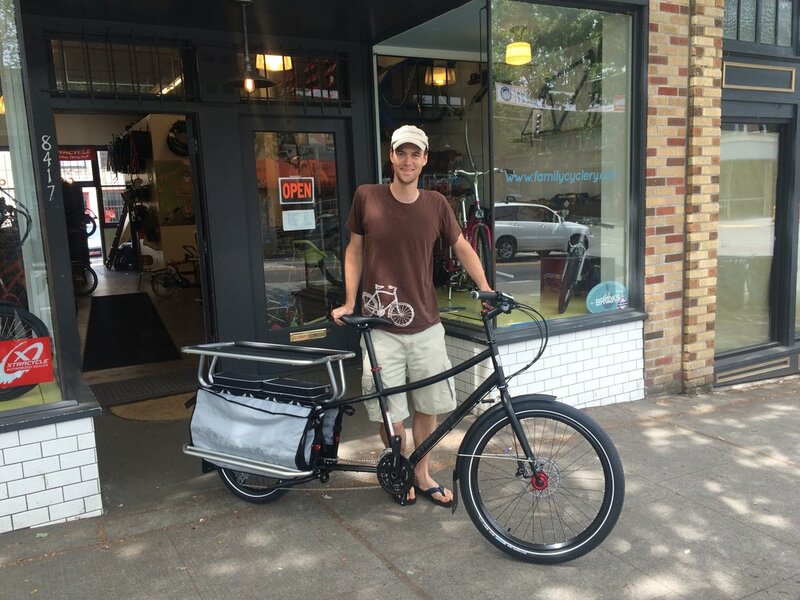 What is comes down to is this: for many Seattle riders, the EdgeRunner is the best cargo and family bike available. It has been the most popular bike at G&O Family Cyclery for a very good reason. While the EdgeRunner is still a very new bike, there have been two distinct revisions so far. This Summer, we enter the third period of the EdgeRunner. Model year 2016 is here! (next time you are in the shop, ask us about why they skipped 2015, it is a funny story). Three different models feature derailleur gears. Derailleur is pronounced, "de-rail-er" (most of the time). Derailleur gears are on the outside of the hub and are the types of gears on most conventional mountain bikes and road bikes and just most bikes in the US context. ANYway, the new ERs with derailleurs are named for the number of gear options on the bike, and a "D," for "derailleurs". Get it? 24D is the entry level bike. It comes in four colors, has mostly good components, but represents a pretty significant quality compromise, compared to the other EdgeRunners. Still, good choice for those on a tighter budget, especially if they do not have too many hills in their life. 27D is a real nice bike. Sporty, with flat handlebars and great quality drivetrain (shifting and stuff) components, as well as mechanical disk brakes of very good quality. This model comes in a flashy red and a subtle grey paint scheme. 30D is the real juice. It only comes in one color, a drop dead gorgeous matte black, with red anodized aluminum accents. This is the lightest and highest performing EdgeRunner available. It is the fastest EdgeRunner and the most fun to ride. The cool thing is that the things that make it so (let's be real) flashy, are the same things which make it the most practical and safest choice for kid-hauling in a city like Seattle. Our hills, our traffic and our weather are well handled by a bike with such a reliable and high performing drivetrain. For Seattle pedal parents, the 30D's best feature is its brakes. Where the 27D features great quality mechanical disk brakes (BB7 mountain, from Avid) the 30D is equipped with excellent quality hydraulic disks (Deore, from Shimano). Hydraulic disk brakes are just better at being brakes, and great brakes are what are making cargo biking in Seattle work. The 30D is already making several Seattle families very happy. "I" means "internally geared hub." That's the kind of drivetrain where the shifting all happens inside the rear wheel. This is common in Dutch bikes, English commuter bikes like Ralieghs from the era of civilized cycling in that country, and basically any bike which needs to be dependable more than it needs to be fast. 11I is an EdgeRunner with serious class. It comes in two colorways, a raspberry purpley-pink and a shiny black. Speaking of shine, the bike is accented all over with chromed-out silver bits. The handlebars, the cranks, the rims and hubs, the fenders, the ridiculously cool looking, extra-long chain guard (! ), the Xtracycle rails (!! ), the four-fingered hydraulic disk brake levers (!!! ), the dynamo-powered headlight (!!!!). This bike is the true, honest hotness. "E" stands for electric. Ebikes are bicycles that feature an electric motor to help you power the bike. This does not replace your pedal effort, it only supports and reinforces it. The world has been waiting and finally, it is here! A quality, reliable and well-supported turnkey, complete, built-in, not DIY, not retrofitted (not that there is anything wrong with retrofits, really! ), intrinsically electric cargo bike is available at last, and from the company that knows family biking best, with the accessories to prove it! 10E is a bike which has completely consumed Davey Oil since it arrived at the shop two weeks ago. Customers have complained of needing to wrestle Davey off the thing for test rides. Mama Oil had to do some carpentry and expand some of the doorways at Casa Oil so that Davey could stay on the bike while he is indoors. He sleeps on the bike. Brushes his teeth on it. Davey reads to the 10E while its batteries recharge. Ask him about it, he will not shut up. 9E, an adorable, limited edition white and blue Bosch EdgeRunner, designed by Xtracycle founder Ross Evans to be his own, personal dream bike. The new electric EdgeRunners are product of a partnership between Xtracycle and Bosch, a company which makes the electric motors found in just about every contemporary anything. 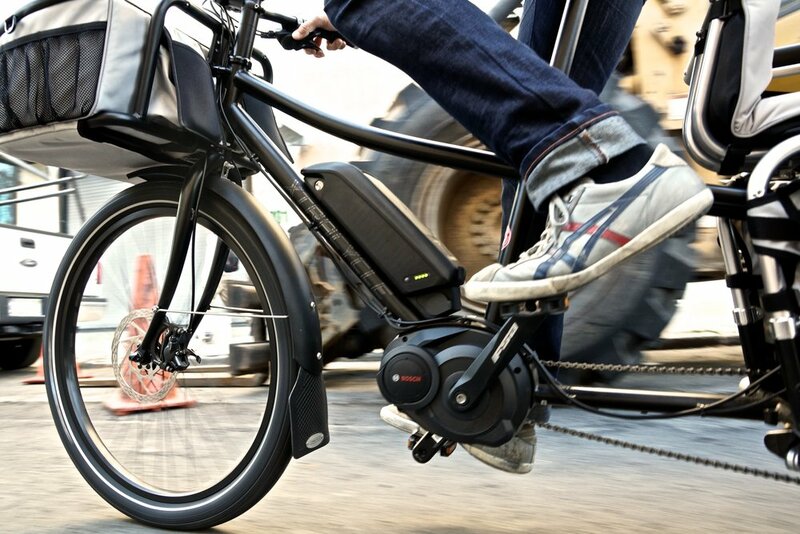 The quality and experience which Bosch brings to the table is unprecedented amongst ebike manufacturers for the US. The Bosch middrive system is called "Performance Line" and it features an extremely sophisticated proportinaly pedelec system. That means that the power of the motor is tuned to your own effort. This creates the impression that you are not on a motorized bike, but rather that you are just totally awesome. After riding a bike with good quality proportinal pedelec, people often spend the next several minutes convinced that they can crush boulders and leap tremendous heights. The power the motor contributes is very natural-feeling, is what I am getting at here. What was I talking about? Oh yeah, the other thing about Performance Line is that it is a middrive system, meaning the motor is not located in one of the wheels, powering that one wheel, but rather it is part of the bicycle's chain drive. This means that as you shift gears, you are not just gearing your own legs' power, but you are also gearing the motor's own effort. This has a number of positive effects; it contributes to battery efficiency along with the pedelec, it makes that pedelec effect (my new band name) even more natural feeling, but most importantly it gives the bike a very high degree of torque. Basically, it is an ebike which eats hills alive. This is desirous. 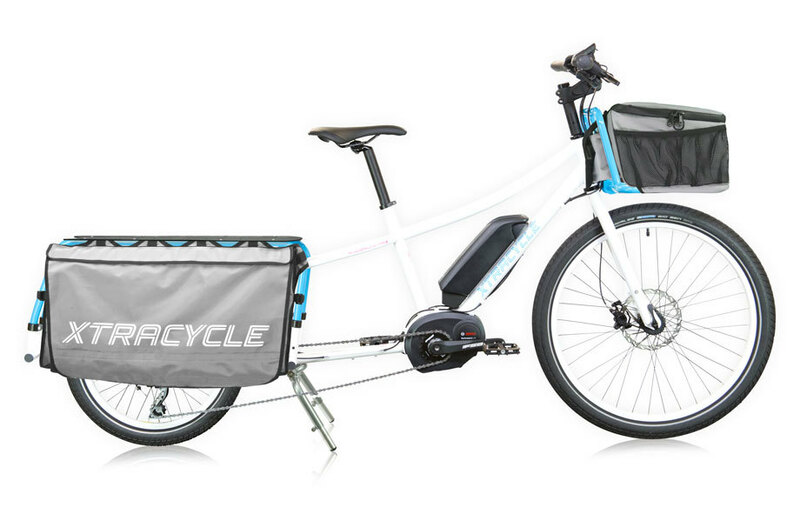 The electric EdgeRunners are also the first to feature a frame-mounted front rack, the PorterRack and its corresponding bag, the PorterPack. You may already know about our passion for front baskets and racks. So come on in and take the new EdgeRunners for a spin! We know that you and your kids are going to love them. Why not come by G&O Family Cyclery on Friday, June 26th from 2pm till 8 and join us for a sweet party? We are welcoming Xtracycle inventor, founder and leader Ross Evans and his lovely family, and a van full of lovely EdgeRunners to Seattle! There will be bike rides, food and fun! Bike rides, provided by G&O and Xtracycle. Food, provided by all of us, let's have a rolling potluck! Fun, because bike people are the best people, and cargo bike people are the best bike people. ...all the cool things we have done with his inventions? ...all the ways our cargo bikes have made our lives better lives and our town a better place? ...all the cool customizations we've done to our cargo bikes! 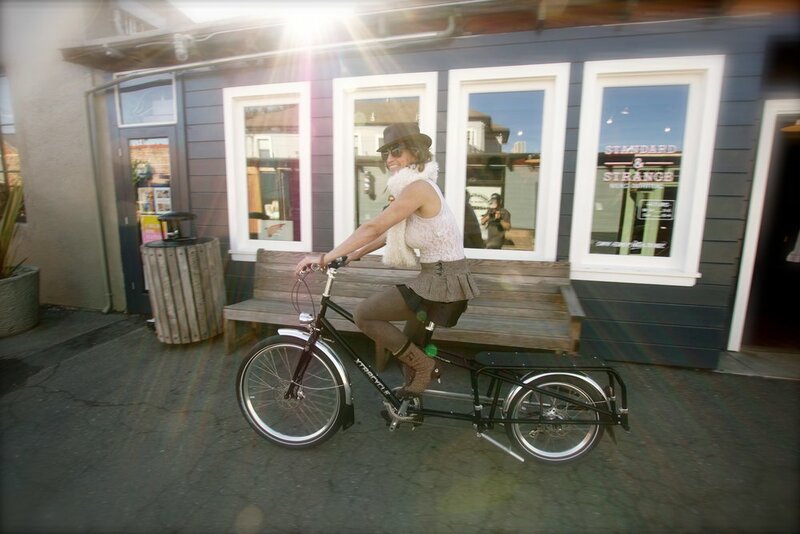 ...all the other cargo bikes we love, because they are all lovable, not just the Xtracycles! Thanks! Have fun out there!